Our seventh annual event! This race is a beautiful looped course through the countryside and past gorgeous homes. You get the option to pick your favorite team for the day's big game and get your race swag in your team's colors! Then, once you finish, you'll have quality options to choose a place to cheer on your team for the big game! Yes, this race is the morning of that lil' ole annual gridiron clash between the University of Texas and The University of Oklahoma. Show your team spirit on race day and then we'll give you information on where to find food, drinks and of course, a big screen TV so you can cheer your favorite team on to victory without leaving the race site! Pick A Side... Or Don't and Run Anyway! Are you a University of Texas alumnus or fan? Are you a University of Oklahoma alumnus or fan? We want to know. When you register, you will get to pick your swag - orange or red. 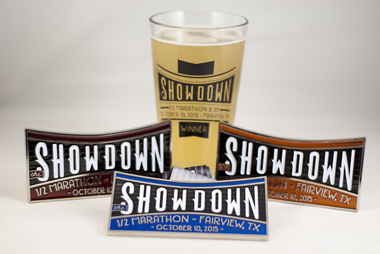 Those who pick a favorite team will have their team colors reflected big and bold on their race shirt, race bib, and half marathon finisher medals. For those that don't have a favorite team between the two or for those who can’t stand either, we’ve got you covered too! Come enjoy an amazing run and be treated to beautiful, quality, race shirts, bibs, and half marathon finisher medals with neither team color reflected on them! 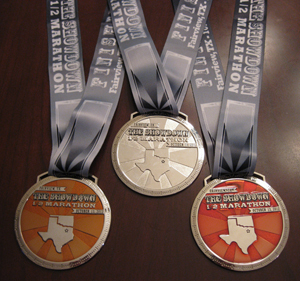 Our 2012 Half Marathon Finisher Medals - Choose Your Color! 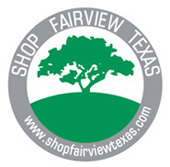 After the race, the Town of Fairview invites you to stay for the day, enjoy our shopping, our restaurants, and entertainment in our large shopping development! Come enjoy an amazing run and be treated to beautiful, quality race shirts, bibs, and half marathon finisher medals! ONLINE REGISTRATION IS NOW CLOSED. You can register race day. Arrive at 6:30 am to the start line. Cost is EXACT cash or check only for $95 for the half marathon and $40 for the 5K. We are sold out of all shirt sizes, but you can claim a shirt after the race from those not picked up during packet pickup! Thank you! Monday, December 31, and Tuesday, January 1 - Another great year of the New Years Double!